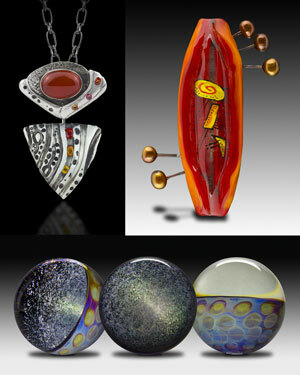 Students will learn to process, color correct and crop their photos of jewelry, glass beads, and other art objects using Photoshop CS5 and Elements 11 with an experienced professional photographer and glass artist. Exposure level optimizing, background removal, color balancing, print and online file formats will be covered. create photo realistic shadows and more. Students will learn how to create color accurate files of their art for use on their website, Etsy in magazine articles, books, portfolios and for juried competitions. Plus, how to purchase recent versions of Photoshop at far less than the full retail price. Students should bring digital photographic files of 6-8 jewelry, beads or glass art. Students should also bring a laptop with Photoshop CS5 or 6 Standard, Extended or Academic and/or Photoshop Elements 11(or higher) already installed. One workflow will be demonstrated using the full Photoshop CS5 and a different workflow will demonstrated using Photoshop Elements 11. Students should be able to run their laptop, open Photoshop, open, save and close files in Photoshop. Also bring notepad, pen or pencil. Materials in Kit: Two example images and two PDF workflows. doug@dougbaldwinphoto.com, please include your contact information and which class you are interested in. You can also call 480-221-0990. Credit cards, Paypal and checks accepted. Checks must clear the bank before your seat is reserved. All fees must be paid in full at time of registration to secure your seat. No refunds after January 1, 2017.